Austrian author; born at Maryampol, Austrian Galicia, Dec., 1855. He studied Talmud under his father (who was a rabbi) and was educated privately in Hebrew and modern languages. 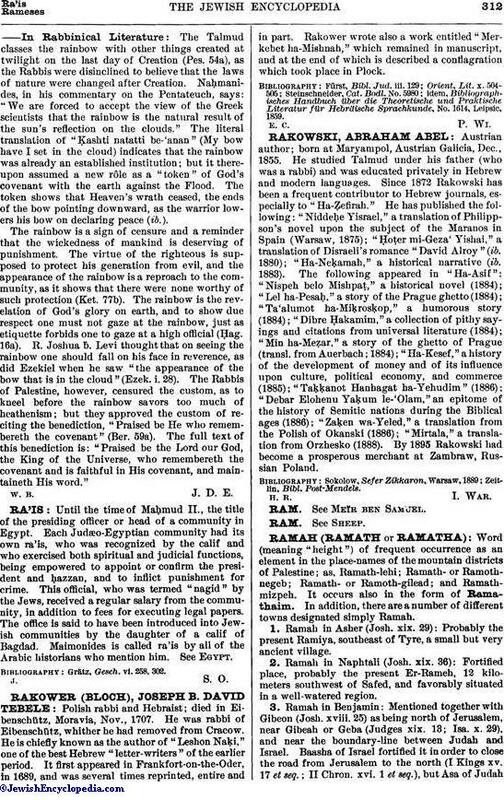 Since 1872 Rakowski has been a frequent contributor to Hebrew journals, especially to "Ha-Ẓefirah." He has published the following: "Niddeḥe Yisrael," a translation of Philippson's novel upon the subject of the Maranos in Spain (Warsaw, 1875); "Ḥoṭer mi-Geza' Yishai," a translation of Disraeli's romance "David Alroy" (ib. 1880); "Ha-Neḳamah," a historical narrative (ib. 1883). The following appeared in "Ha-Asif": "Nispeh belo Mishpaṭ," a historical novel (1884); "Lel ha-Pesaḥ," a story of the Prague ghetto (1884); "Ta'alumot ha-Miḳrosḳop," a humorous story (1884); "Dibre Ḥakamim," a collection of pithy sayings and citations from universal literature (1884); "Min ha-Meẓar," a story of the ghetto of Prague (transl. from Auerbach; 1884); "Ha-Kesef," a history of the development of money and of its influence upon culture, political economy, and commerce (1885); "Taḳḳanot Hanhagat ha-Yehudim" (1886); "Debar Elohenu Yaḳum le-'Olam," an epitome of the history of Semitic nations during the Biblical ages (1886); "Zaḳen wa-Yeled," a translation from the Polish of Okanski (1886); "Miratala," a translation from Orzhesko (1888). By 1895 Rakowski had become a prosperous merchant at Zambraw, Russian Poland.